HMS Severn returning to Portsmouth before being decommissioned last year. The warship caught thieves in the act of plundering a First World War shipwreck. 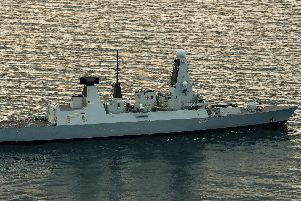 THIEVES caught plundering a First World War shipwreck by a Royal Navy warship from Portsmouth have been fined £250,000. HMS Severn's crew found the huge hydraulic claws of Dutch-registered salvage ship Friendship lifting £90,000 of steel and copper. A century later and HMS Severn was on patrol around the Scillies in August 2016 looking for trawlers breaking international fishing regulations when she was asked to investigate the suspicious activities of the Friendship. The ship was sailed back to Fowey in Cornwall, where she and her illegal haul was handed over to the Maritime Management Organisation. It took another 18 months to build a watertight case against Bakker and the boat’s owners – and six more months after that for sentence to be passed at Newcastle Crown Court. Bakker admitted that he did not have the relevant licence and explained how the ship’s automatic identification system had been dimmed to avoid detection. In addition, the judge ordered the firm should pay more than £190,000 in compensation. Commander Sarah Oakley, commander of the navy’s fishery protection squadron, said: ‘’It’s great to hear that the hard work of Severn has paid off with another successful conviction. HMS Severn was decommissioned last autumn ahead of new generation River-class ships entering service.